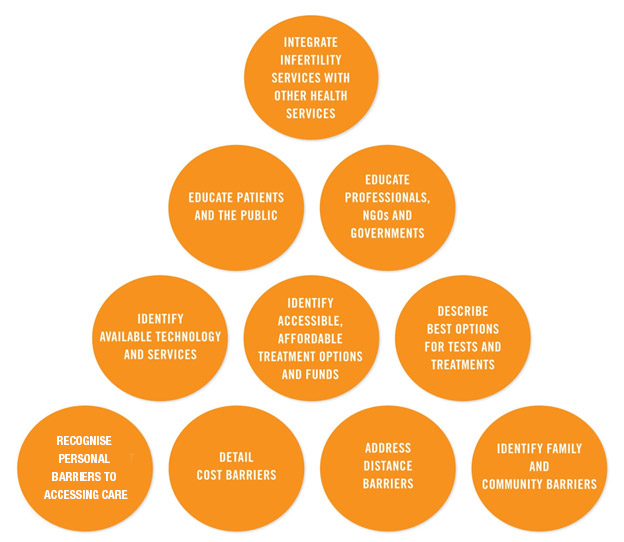 Recognise personal barriers to accessing care: Personal, cultural, religious and family values that prevent access or limit care need to be recognized and addressed by people with infertility, by patients and by care providers. Detail cost barriers: The cost of initiating investigations and treatment for infertility often is not covered by available state health services and may require out of pocket payment. This can deter couples from seeking help. Address distance barriers: Geographical factors can influence health seeking behaviour in circumstances where roads and transport are suboptimal. Identify family/community barriers: Infertility is regarded in many communities as a personal issue and declaration by people of their infertile status and can lead to stigmatisation. Identify available technology and services: Although assisted reproduction requires sophisticated technology, basic investigations and treatments for infertility are not always costly and could be more widely available. Identify accessible, affordable treatment options and funds: Funding for fertility services is rarely available in low resource settings, but some components of investigation and treatment may be available as part of general reproductive health promotion programmes. Awareness of the cost of additional treatment and possible sources of funds within the family or community can help make informed choices. Describe best options for tests and treatment: Knowledge about clinical and cost effectiveness of tests and treatments can help women and men make appropriate decisions. Educate patients and the public:. Knowledge about fertility and fertility awareness—including how to prevent infertility, when to seek healthcare, and how to access, appropriate time for seeking medical help and understanding the need for fertility services—can help overcome some of the existing barriers. Educate professionals, NGOs and governments: Awareness and support from service providers and others will substantially improve access to fertility services. Integrate fertility services with other health services: Use of existing pathways of care offers opportunities for provision of fertility services.